@ChasingASMBlog ASM v2 #50. Have you done that? Thanks for the recommendation Gus! For a full list of my Reader Request Month entries, click here. But J. Michael Straczynski and John Romita Jr.’s output for Amazing Spider-Man #50 (vol. 2) demonstrates that there are a few instances where the Peter and MJ marriage inspired excellent stories. JMS was in the midst of one of the truly great writer-runs on a Spider-Man title when this issue was published in 2003, and his hot streak certainly continues here as he delivers a story that’s not only brutally honest, but heartwarming. What made the first half of the JMS run so worthwhile (especially when compared to the bulk of the stories he did post ASM #500) was his characterization of the man under the Spider-Man mask, as well as his supporting cast – especially characters like MJ and Aunt May. Interestingly enough, Paul Jenkins was doing a lot of the same great character-heavy stories during his runs on Peter Parker: Spider-Man and Spectacular Spider-Man, so perhaps my praise is really meant for Marvel’s then-editorial team for washing away the stain left by the lackluster Howard Mackie/John Byrne reboot of ASM in the late-90s. But it cannot be ignored that of all these creators, JMS with his lofty mainstream resume, was the one tasked with resurrecting the Spider-Man brand. As a result, there’s a certain desperation from his characters to not only do the right thing, but to actually figure out what the right thing is. There’s a moment in ASM #50 (vol. 2) when a very frustrated MJ continues to verbally attack Peter for how his double-life as Spider-Man continues to torment her. She’s not just lashing out against the suicidal nature of being a superhero – she says in this issue and in countless others that preceded it that she accepts that – but also the little things, like how Peter can’t even acknowledge who she is when he’s wearing the Spider-Man costume. It’s an incredibly raw confession from MJ and a better portrayal of the loneliness she has long experienced as a superhero’s wife than any other storyline I can think of. Because not only do Peter’s actions hurt her, there’s also a universal recognition from both characters that there’s absolutely nothing that can be done to change things. JMS leans on some tried but tested literary tropes to advance the story. He sets the issue inside an airport, where both Peter and MJ coincidentally bump into each other as they’re attempting to transfer to flights to opposite ends of the United States in an attempt to salvage their marriage. This plot device is a little rom-commy on the surface, but it does certainly give credence to the idea that these two were in fact meant to be together, or at least were meant to have this conversation to determine if they were meant to be together. That’s because the inevitable conversation they must have is not easy to come by. 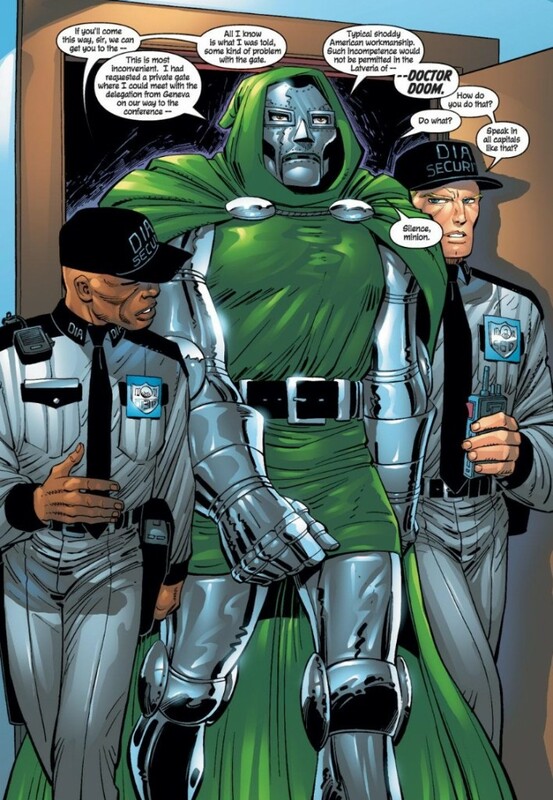 Also at the same airport is Doctor Doom, and protestors from the “Free Latveria” movement are launching a full attack on the longtime villain, detonating explosives throughout the facility (Captain America is also there, though in to not only help Spidey fight the bad guys, but to have a critical role in the story’s emotional climax). Sure, it’s a plot twist that maybe pushes the envelope of plausibility a bit too far, but it also serves a purpose. 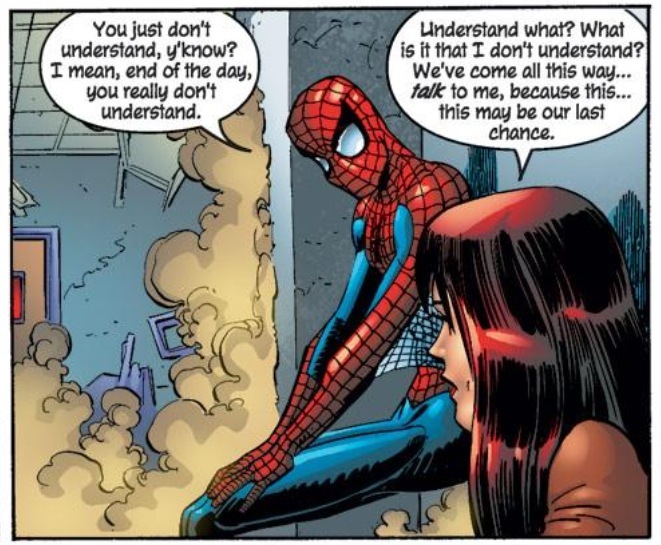 What better way is there to demonstrate the emotional/romantic gap between Peter and MJ by having the conversation they’re trying to have with each other get interrupted by his responsibility to be Spider-Man? JMS works some wonderful misdirection when Peter tells MJ that she “doesn’t get it.” On first blush, these words indicate that Peter has had his epiphany and that epiphany is that he and MJ are being torn apart by problems that just cannot be resolved in a way that’s fair to both of them. But instead, Peter throws a Hail Mary of sorts to MJ and tells her that his devotion to her is not only about love but it’s about “need,” i.e., he “needs” her. Need is such a funny word in a relationship as it can simultaneously be a good and bad thing. I’ve long maintained that there’s a bit of a power struggle in even the healthiest of romantic relationships. You never want to see one half of a relationship possess a dominating share of the power because my experience has found that my marriage is infinitely in a better place when my wife and I are working as a cohesive unit – aka “Team Ginocchio” as we sometimes say to each other when things start to get even remotely dicey. We rely and depend on each other to see a rough situation through, but we never go into a situation blindly expecting the other person to pick up all of the slack. What Peter ends up describing as his “need” to MJ is similar to “Team Ginocchio.” MJ is initially incredulous to his proclamations because how can someone who has the power of Spider-Man “need” a regular person? But Peter explains that it’s just a case of nothing seeming to “work right,” when MJ is not around. Sure he has the superpowers, but what good is web slinging and wall crawling without the love and support of MJ? 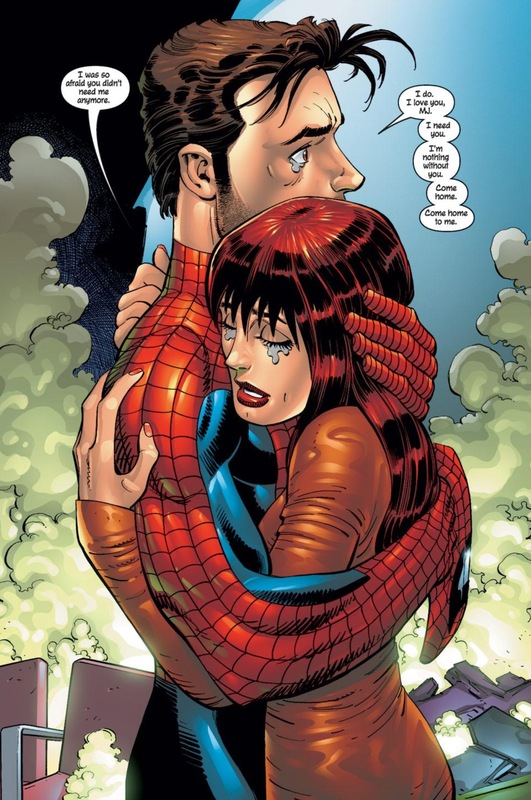 In other words, JMS manages to hit upon another variation of that old classic: “with great power, must also come great responsibility.” As Spider-Man, Peter has always been responsible to do the “right” thing, but his relationship to MJ helps illuminate the actual purpose of his responsibility. Peter “needs” MJ, because without her and her love, he’s just another rudderless superhero, risking his life every day to protect who? To do the right thing for who? To make amends to who? 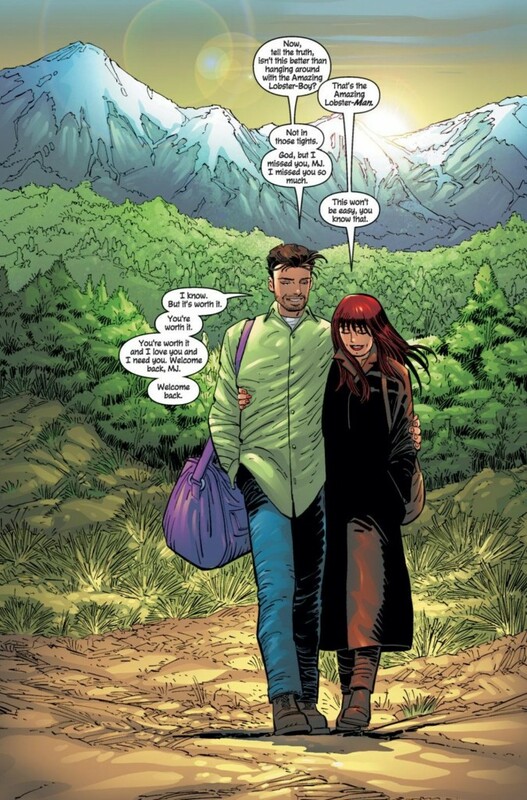 By issue’s end, Spider-Man introduces his “friend” MJ to Captain America as the couple leaves the airport and walks out into the sunset together, the worst of their marital problems now in the rearview mirror (until good ol’ Mephisto shows up in a few years). It’s a fitting end to a beautiful issue that emphasizes what worked best in the Peter/MJ pairing. It’s also the kind of story that makes me backtrack a bit on my claims that the Marvel universe no longer “needs” their marriage, though if more writers put the care into the couple as JMS did (J.M. 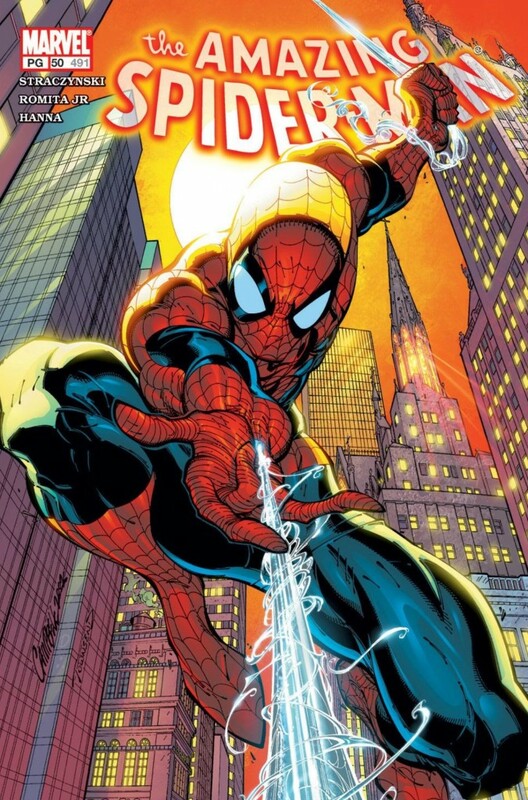 DeMatteis certainly deserves credit for his work throughout Spidey history as well) perhaps I would have a more definitive opinion on that issue.